Glendale (pronounced /ˈɡlɛndeɪl/) is a city in Maricopa County, Arizona, USA. It is about nine miles (14 km) northwest from Downtown Phoenix. According to 2006 census, the population of the city is 246,531. 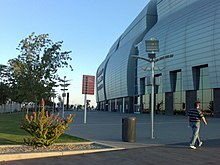 The NHL's Phoenix Coyotes and NLL's Arizona Sting started to play in Glendale when Jobing.com Arena opened in December 2003. Also in Glendale is University of Phoenix Stadium. It is the home of the NFL's Arizona Cardinals and the Fiesta Bowl, and opened in August 2006. In 2008, Super Bowl XLII was played there when the New York Giants beat the New England Patriots. The Chicago White Sox and Los Angeles Dodgers moved to Glendale for a shared spring training 2009. Glendale calls itself “Arizona’s Antique Capital”. It is supported for its claim from Sunset Magazine. Glendale is home to the Arrowhead Towne Center mall in the northwest part of the city. Glendale also is home to Midwestern University, metro Phoenix's first medical school, as well as a major post-graduate international business school. An extension of METRO light rail service is planned to serve the city. Glendale is at 33°32′19″N 112°11′11″W﻿ / ﻿33.53861°N 112.18639°W﻿ / 33.53861; -112.18639 (33.538654, -112.186261). According to the United States Census Bureau, the city has a total area of 55.8 square miles (144.4 km²), of which, 55.7 square miles (144.2 km²) of it is land and 0.1 square miles (0.2 km²) of it (0.13%) is water. As of 2000, there were 218,812 people, 75,700 households and 54,352 families in the city. The population density was 3,929.5 people per square mile (1,517.3/km²). The population consists of 75.54% white, 4.70% black or African American, 1.45% Native American, 2.74% Asian, 0.13% Pacific Islander, 11.97% from other races, and 3.47% from two or more races. 24.84% of the population were Hispanic or Latino of any race. There were 75,700 households out of which 39.9% had children under the age of 18 living with them. 53.5% were married couples living together. 12.8% had a female householder with no husband living there. 28.2% were non-families. 21.3% of all households were made up of individuals and 5.8% had someone living alone who was 65 years of age or older. The average household size was 2.85. The average family size was 3.33 people. The meddle age was 31 years. For every 100 females there were 99.6 males. For every 100 females age 18 and over, there were 97.1 males. The median income for a household in the city was $45,015. The median income for a family was $51,162. Males had a median income of $35,901 versus $27,736 for females. The per capita income for the city was $19,124. About 8.8% of families and 11.9% of the population were below the poverty line, including 15.3% of those under age 18 and 9.5% of those age 65 or over. Ground level of the stadium. Glendale is the home to the Arizona Cardinals of the National Football League (NFL). The team formerly played at Sun Devil Stadium on the campus of Arizona State University in Tempe. The History Channel featured the stadium because of its roll-out natural grass field. The stadium hosted Super Bowl XLII in 2008. Almost one year later on January 18, 2009, it hosted the NFC Championship Game as the Arizona Cardinals defeated the Philadelphia Eagles 32-25 for the franchise's first ever Super Bowl berth. Gila River Arena (formerly Glendale Arena and Jobing.com Arena) is next to University of Phoenix Stadium. It is the home of the Arizona Coyotes of the National Hockey League (NHL). It is also the home of the Arizona Sting of the National Lacrosse League (NLL). In 2009, the Los Angeles Dodgers and the Chicago White Sox shared a spring training in Glendale. The BCS National Championship game also came to the stadium in 2006 and 2010. The Bowl Championship Series was replaced by the College Football Playoff (CFP) in 2014, and the final of the CFP, the College Football Championship Game, will come there in 2016. There are a number of higher education campuses in Glendale. Glendale Community College and Glendale Community College North are members of the Maricopa County Community College District. Arizona State University has its West campus just across the border from Glendale in west Phoenix. Midwestern University is a graduate college of medicine in Glendale. Thunderbird School of Global Management is also a graduate school. It is specialized in international management. Job for a Cowboy - An American death metal band formed in Glendale in 2003. Jamie Varner - He is the former WEC Lightweight champion. He is an alumnus of Deer Valley High School in Glendale, Arizona. ↑ "Annual Estimates of the Population for Incorporated Places over 100,000" (CSV). 2005 Population Estimates. U.S. Census Bureau, Population Division. 2006-06-21. Retrieved 2006-11-14. ↑ "Annual Estimates of the Population for All Incorporated Places in Arizona" (CSV). 2006 Population Estimates. U.S. Census Bureau, Population Division. 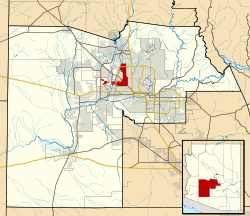 Wikimedia Commons has media related to Glendale, Arizona. This page was last changed on 10 July 2018, at 19:20.